Specializing in properties of distinction on South Florida’s Gold Coast, Luxury Resort Portfolio provides the highest level of customized service, matched and exceeded only by the highest level of performance exemplary of the exceptional real estate our firm represents. Luxury Resort Portfolio has the skills and advantages to facilitate transactions and bring about the results our clients expect. Our definitive Global Marketing Exposure promotes each individual property with targeted advertising and marketing, strategy development and the superlative representation it needs to obtain a successful sale in today’s volatile real estate market. Our Global Marketing Exposure and professional expertise have proven to be vital assets. Successfully demonstrating numerous benchmark sales from our portfolio. We are confident through our extensive marketing and negotiating techniques in the Luxury Real Estate market, and the exposure through the most advanced techniques in interactive technology, that we can achieve your Real Estate goals, and bring about the results you want. Contact us for details, we look forward to sharing our expertise in the marketing and selling of the finest properties South Florida has to offer. Luxury Resort Portfolio welcomes your inquires in how we can facilitate your next real estate transaction. 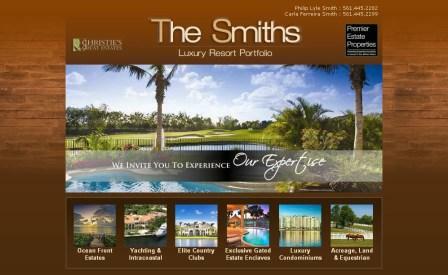 This entry was posted in Home Sales, Long Lake Estates, Luxury Resort Portfolio Lifestyle Guide - The Art Of Living Well, The Smiths on October 8, 2009 by Luxury Resort Portfolio. 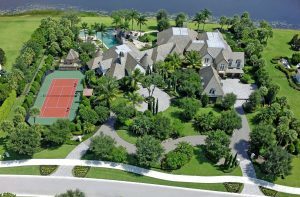 Long Lake Estates, situated along Boca Raton’s “Millionaire Mile”, is the embodiment of South Florida real estates luxury and privacy. Here in this exclusive, gated enclave of custom built one acre estate homes, you can truly relax, secure in the knowledge that you have your own private haven, secluded from the rest of the world. All of Long Lake Estates real estate has been custom-built and every Long Lake Estates homes for sale is unique. Each home site in Long Lake Estates has lushly landscaped tree lined lots of at least one-acre in size, adding to the community’s aura of serenity, exclusivity and park-like setting. The lavishly manicured landscaping, as well as the panoramic waterfront views of Long Lake Estates real estate, enhances the inherent beauty of the individual estates even further. Located in the heart of Palm Beach County along Clint Moore Road, Long Lake Estates real estates South Florida Boca Raton location is minutes from downtown historic Delray Beach’s gourmet dining along Atlantic Avenue, Palm Beach’s Worth Avenue luxury brand shopping, and Ft. Lauderdale’s yachting paradise of Las Olas Boulevard. The Gold Coast community of Long Lake Estates lies between the St. Andrews Country Club and The Oaks at Boca Raton, and is only a 15 minute drive to the Boca Raton Private Executive Airport, while Palm Beach and Ft. Lauderdale International Airports are only a half an hour away. The Intracoastal Waterway, miles of white sand golden beaches and the Atlantic Ocean, are close by as well. For more information on Long Lake Estate homes and everything that this exclusive community has to offer, please contact The Smiths. 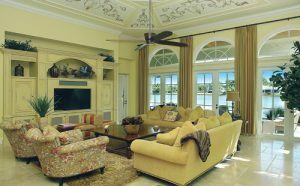 This entry was posted in boca raton, Long Lake Estates, Luxury Resort Portfolio Lifestyle Guide - The Art Of Living Well on September 23, 2009 by Luxury Resort Portfolio. When you invest in Mizner Country Club real estate, you gain entry to a life of luxurious possibilities. 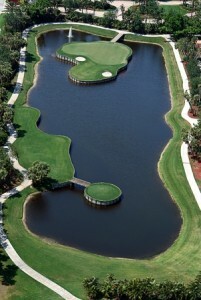 Among the many amenities that residents of this plush enclave enjoy are its Arnold Palmer Signature Golf Course, a tennis and fitness center, and its Grande Clubhouse and Palazzo dining facilities. For more information on Mizner Country Club homes and everything that this exclusive community has to offer, please contact The Smiths. This entry was posted in Luxury Resort Portfolio Lifestyle Guide - The Art Of Living Well, Mizner Country Club, The Smiths on September 18, 2009 by Luxury Resort Portfolio. In the privacy of prestigious Long Lake Estates,a sprawling lakefront estate imbued with gracious Old World charm. A quiet tropical oasis, prestigious Long Lake Estates offers the utmost privacy with large estate properties nestled on a serene lake in gated seclusion. Long Lake Estates is a prestigious gated enclave of 1+ acre estates, beautifully sited on a tranquil lake surrounded by lush foliage. Superb beaches and Mizner Park’s world-class shops and restaurants are close by. 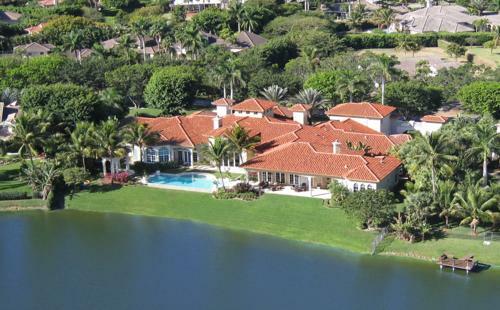 In a beautiful lakefront setting, this expansive Long Lake Estate brings together state-of-the-art luxury and gracious Old World character in Boca Raton, Florida. Grandly scaled for indoor/outdoor entertaining, this sprawling Long Lake Estates 14,000+/- square-foot home lends an inviting atmosphere with a subtle palette and charming Moorish-inspired details. Turkish marble floors, coffered ceilings, and stone columned archways are showcased throughout. Accented with an elaborate floor-to-ceiling stone fireplace, the soaring formal living room is dominated by dramatic lake views across the infinity-edge pool. An outdoor fireplace appoints the lovely lakeside loggia by the pool. Family, staff, and guests enjoy maximum privacy with seven bedrooms including a luxurious master suite, VIP suite, guest wing, upper-level staff quarters, and a separate guest house. Distinguished by exceptional design and impeccable appointments, this magnificent Long Lake Estates residence affords luxurious lakefront living in an exclusive estate enclave. 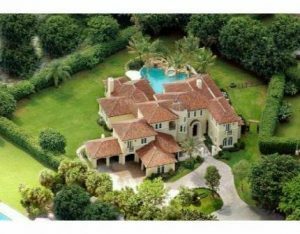 Property: A private haven in a lushly landscaped lakefront setting, this sprawling Long Lake Estates Moorish-inspired estate affords unparalleled indoor/outdoor entertaining with 14,000+/- total square feet. Lakeside gatherings center on the elegant infinity-edge Pool with Spa. To either side are a charming stone Gazebo and a well-appointed Loggia with coffered ceiling, Turkish marble floor, stone gas-fired fireplace, and Summer Kitchen. The property is served by a sweeping brick pavered circular drive, culminating in a welcoming porte cochere. An auxiliary drive serves the side entry. 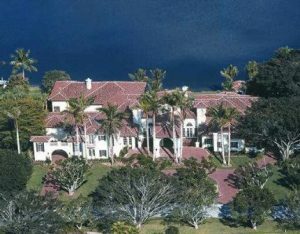 Residence: Superbly scaled and elegantly detailed, this stately Long Lake Estates lakefront villa offers 7 Bedrooms, 8 full and 3 half Baths, and a 6-bay Garage. Old World appointments include Turkish marble floors, coffered ceilings, stone columned archways, and elaborate moldings. Large windows with hurricane-impact glass and a back-up power generator are featured throughout. Contact The Smiths – Luxury Resort Portfolio today for your personal viewing of this impeccable estate … and tour room after dazzling room that features design elements reserved for the worlds most tasteful home buyers. This entry was posted in Uncategorized on September 17, 2009 by Luxury Resort Portfolio. 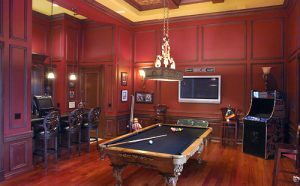 Master craftsmanship is evidenced throughout this magnificent Mizner Country Club Santa Barbara-style villa totaling 7,887± square feet with 4 bedrooms, 4 full/2 half baths, elevator, and indoor/outdoor surround-sound system. Notable details include the authentic barrel tile roof, impact glass windows and exterior doors, interior doors of Arizona alder, hand-plastered walls, and pecky cypress ceilings. Stately palms and cypress trees line the Chicago brick motor court arriving at the 3-bay garage and gated entry courtyard where a marble wall fountain and firepit establish the estate’s engaging air. Capitalizing on the stunning fairway views, the outdoor entertainment area features a beach-entry lagoon-style pool with rock waterfall spa spilling from an octagonal loggia with coral stone columns. The tumbled marble summer kitchen, cedar sauna, and outdoor shower are added luxuries at Mizner Country Club, Delray Beach 33446. This entry was posted in Uncategorized on September 11, 2009 by Luxury Resort Portfolio. Elaborately custom appointed, this Mediterranean masterpiece located in Mizner Country Club is perfectly set amid luxuriant tropical greenery capturing expansive views across the fairway. A stately circular drive introduces the villa which opens onto a spectacular resort-style outdoor entertainment area hosting memorable social gatherings. The sumptuous heated pool is beautifully designed with a raised spa and a dolphin design embellishing the bottom. Serving the poolside lanai, a tiled summer kitchen with dual grills, refrigerator, sink, and tumbled marble bar opens by a charming lighted tiki hut alongside an enchanting rock waterfall. Replete with exquisite moldings, faux painting, and marble inlays are among a wealth of custom details showcased throughout this magnificent residence creating an impressive yet warmly welcoming ambiance. Five bedrooms, 5½ baths, and a 3-car garage are included in 6,100+/- total square feet at Mizner Country Club, Delray Beach, Florida 33446. 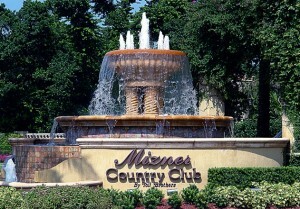 This entry was posted in Mizner Country Club, New To Marktet on September 9, 2009 by Luxury Resort Portfolio. Residence: Designer decorated and furnished, this exquisite Donatella villa at The Oaks at Boca Raton is a crowning achievement by acclaimed Charlse-Watt, blending breathtaking appointments and lavish luxuries. Smart-house technologies with AMX touch-pads control all systems including security, climate, lighting, surround-sound audio, and televisions. Mosaic-inlaid travertine marble floors, elaborate moldings, and hurricane-impact glass are also featured. Five bedrooms, 6 full and 2 half baths, plus a 4-car garage are included in 7,860± total square feet at The Oaks at Boca Raton. 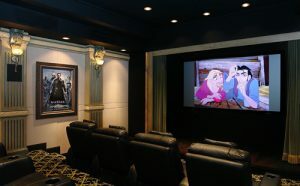 This entry was posted in Gated Enclaves, Luxury Resort Portfolio Lifestyle Guide - The Art Of Living Well, The Oaks at Boca Raton, The Smiths on September 4, 2009 by Luxury Resort Portfolio. Is it possible that after a long, arduous and punishing real estate slump…the worst decline in home values in recent history… we are starting to see positive indicators that we might very soon be out of the woods? The recent housing market forever known as the catalyst that lead the US into the “Great Recession” has finally began experiencing a change in momentum…and for the better. Recent indicators show that the housing market is rebounding and faster than expected! First Time Buyer Credit | Housing affordability and the approaching deadline of November 30, 2009 to qualify for the First Time Home Buyer’s Tax Credit of $8,000 have increased sales activity. Home sales rose in July to the highest level in well over two years. NAR estimates that 1.8 Million to 2 Million first-time Buyers will take advantage of the stimulus credit. Lower Interest Rates | Mortgage rates for 30-year home loans increased slightly this week, but still remain close to the record lows we reached over the spring. Contract activity for pending home sales has increased for six consecutive months. According to the National Association of Realtors this is a pattern not seen in the history of the index since it began in 2001. The Pending Home Sale Index, a progressive study of contracts that were signed in July indicate an increase nationally in sales contracts of existing homes of 3.2 percent to 97.6. Showing and overall increase of 12 percent higher than July 2008. In the Southern region of the country, pending home sales activity increased 3.1 percent to 103.8 in July, an increase of 12 percent from July 2008. The Western regions of the US experienced the largest gains with 12.1 percent to 112.5, that being a 20.0 percent increase from one year ago. Both the Northeast and the Midwest had downturns; the Northeast fell 3.0 percent to 78.8 in July, however their index is still higher than July 2008. The Midwest also slipped 2.0 percent to 88.1, but with an increase of well over 8.1 percent from a year ago. With all this positive news on the horizon, can a recovery be imminent? Anyone who follows the real estate market can see that the market is still not back to normal…but was it ever normal with astronomical yearly increases in home values? The party had to end at some point. The recent slump has erased $4 Trillion in homeowners’ equity. Thousands of people just simply walked away from their homes because they were worth far less than what they paid for them. Resorting to options once unthinkable for a Seller to consider; Short Sales, Foreclosures and even worse Bankruptcy. The Buyers did not fare any better, feeling they were pushed out of the market because of the credit crunch, not qualifying for lender’s new stringent lending policies. Making the speculation of attaining the “Dream Home” a thought of the past. The last couple of years have really battered both the Buyers and Sellers. For a while either side failed to accept the current market. Not everyone was in Foreclosure or in dire need of selling because they were going broke. Nor was your home worth what it was once valued at it’s peak. Not all the upgrades, built-ins and bells & whistles in the world you added to your home after you purchased it…made it immune to falling home values. Finally it seems both sides are on the same page and understand the current market and comprehend VALUE!!! Yes! Value…appreciate it when they see it and understand when it’s just not there! The faster that home prices begin to stabilize, the sooner that Buyers feel confident and financially secure on making home purchases, and the quicker lenders and the credit markets start to extend credit responsibly once again. We can stop the demise of the American Dream of home ownership and right the wrongs of the past. This entry was posted in Uncategorized on September 2, 2009 by Luxury Resort Portfolio. Residence: Superbly scaled and elegantly detailed, this stately Long Lake Estates lakefront villa offers 7 Bedrooms, 8 full and 3 half Baths, and a 6-bay Garage. Old World appointments include Turkish marble floors, coffered ceilings, stone columned archways, and elaborate moldings. Large windows with hurricane-impact glass and a back-up power generator are featured throughout. Grandly scaled for indoor/outdoor entertaining, this sprawling Long Lake Estates 14,000+/- square-foot home lends an inviting atmosphere with a subtle palette and charming Moorish-inspired details. This entry was posted in Long Lake Estates, Luxury Resort Portfolio Lifestyle Guide - The Art Of Living Well on August 14, 2009 by Luxury Resort Portfolio. WEST PALM BEACH — Plunging home prices and stable incomes have made homes in Palm Beach County and the Treasure Coast enticingly affordable to most families, the National Association of Home Builders said Monday. In Palm Beach County, nearly two-thirds of homes sold in the first quarter were in reach of a typical family, according to the NAHB/Wells Fargo Housing Opportunity Index. And in the Treasure Coast, more than four-fifths of homes were affordable for a median-income family. In Palm Beach County, 65.7 percent of new and existing homes sold in the county were affordable to a family making the county’s median income of $67,600, the study says. That’s up from 53.5 percent in the fourth quarter. Affordability hit a low of 28.8 percent in 2006. In the Treasure Coast, the housing affordability index soared to its highest level in 15 years, the index says. Some 81.4 percent of homes sold in the first quarter were in reach of a family making the area’s median family income of $59,600. Surprisingly, incomes changed little from 2008 to 2009, according to the index. Despite rising unemployment rates and a weakening economy, the region’s estimated median family income held steady. Income rose 2.4 percent in Palm Beach County from 2008 and fell 0.3 percent in the Treasure Coast. The national housing market saw a similar trend, as affordability rose to its highest point in the 18-year history of the index. A family earning the U.S. median income of about $64,000 could afford around 73 percent of all the homes sold in the first quarter, said David Crowe, NAHB’s chief economist. Crowe has forecast that the housing market will begin picking up toward the end of this year and turn around by 2011. Builders, however, still face challenges getting loans from banks to finance new construction projects, while many borrowers must comply with more stringent standards that often require them to come up with more money for a down payment. 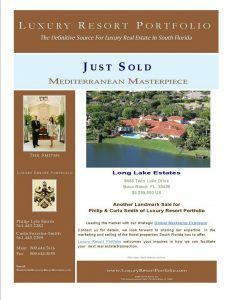 This entry was posted in Palm Beach County, real estate on May 22, 2009 by Luxury Resort Portfolio.